I have at LAST found the solution for getting timid squid to attack a jig. I have an old radio that I lower into the water (wrapped in waterproof bags of course),near to my jig. When the Beatles songs come on the squid get SO angry they cannot help themselves and go for the jig. "Elenor Rigby " is good,but "When i'm 64 "and"Give peace a chance" are absolute gems. Of course you must be very careful......if any songs at all by John Denver or Pat Boone come on the squid immediatly fall asleep ! Edited by kingyfisher, 31 March 2008 - 01:32 PM. hahaha nice one, I will give that a go! do I need a loud speaker? do they like rap music? firstly thanks to Glenn for fixing my stuff up with e-mail address and Glenn the aapt will do fine. OK here is a trick I use here in morton bay for shy or bloody fussy squid when fishing in shallow water less than 10 feet as I only sight fish where I fish and get very good results. A new jig will sink too fast as most are set up to do just that and fussy squid won't go near them other than a look to see what the hell was that that flew past at a hundred knots and then back off. here's what you do...first wrap a small length of thin solder wire around the shaft above the top ring of spikes and a drop of supa glue will hold it in place just fine and not put off the squid,about 2 or 3 wraps should do it then you shave off enough of the weight (if it is lead) until your jig sinks ever so slowly and EVENLY. do this in a bucket of water in the laundry or sink so that the jig still sinks slowly and is almost ready to use. When you get down to the salt water pull out a file and make small shaves until the jig only sinks VERY slowly or if possible almost neutral boyancy and sits level as is sinks. Fussy squid can't help them selves and sneek up behind the jig and strike from the rear and hey presto come here sucker. We have perfected this method for the big tiger squid we get here in morton bay and our results are good. We cast out past the mob of squid as not to spook them as these are easily spooked and wind in to just before where they are sitting and then just twitch your jig a little and retrieve line slowly until you get their attention and work your magic from there. I only use 6lb line and 8lb flurocarbon leader so a very light drag is a must and a medium action rod of 2.5mtrs. The water is so shallow where I fish I have to wait until the tide is 2hrs in so then there is enough water to fish and thats when they come in off the weed banks to hunt and guess who's waiting for them ME. shrimp hunter is the jig of my choice and works mighty fine for me. hope this bit of information helps you out some and fixes your fussy squid problem. hey r u 12, thanks for sharing your squid method! should help a few people catch those shy squid. had a few big ones down there this weekend and even managed to knock off a couple of the big ones but there were other large squid that the only way I was going to take them out was with a rock , sitting right in front of me in only 2 feet of water teasing the hell out of me coming up to the jig and backing away 6 inches from it and doing it again and again...BASTARDS. oh well you win some you loose some. I agree wth supersquid. Sometimes squid are just not hungry like all living creatures, so they will not try and eat anything. I have tried all techniques mentioned from using the smallest jigs, different colours to bait fish teasers and they just didn't bite. I do agree when the water is clear and calm and you can see them in schools they are not in feeding or hunting mode therefore not hungry. When you can't see them that is when they are hiding in weed ready to attact and eat whatever cruises past. If squid become "shy after you have caught a few and there are still a good number around give the area a rest for 10 minutes or so and then try again.If you still get no response try a different size /coloured jig. Yes if they are shy downsize the jig and also colour. try a different retrieval technique. Make sure your imitating a injured prawn/bait fish. try letting the jig settle at the bottom for 5~10 seconds. Squid will often pounce on the jig on the bottom. At first I like to work the top of the water at first. then I will try jiggin the bottom. Most of the time Bottom is the best. I recently just learn the zig zag technique. give your jig 2~3 small jerks to the right (or left) your jig will dash in a zig zag. then let it sink... then lift your rod... let it sink... then zig zag again. it will really attract them. you guys just keep getting snagged on the bottom with your jigs so i have something to collect! p.s. scuba divers get attracted to expensive looking jigs. doesn't matter what colour. hi, it's not the size. try casting it out and bringing it in near them, this have worked for me or try using different colours. the only problem with fussy squid is getting them to take notice of your jig but when they are in a fussy mood they will normally just poke and prod your jig to see if it's going to fire to life. sometimes I think they are just having a taste..so to speak and when they are doing this I just give the jig a short sharp twitch away from them...5 or 6 inches.. to see if they are going chase it or not and if they do just repeat it untill they grab it but sometimes it can take a few go's to do it right. and if all else fails....resort to plan B...use a rock..lol. this can be really frustrating. try smaller jigs or maybe a baited jig to see if they work better. Just want to ask if you feel that Size 3.0 is too big to be used on Malaysia Kelongs ? 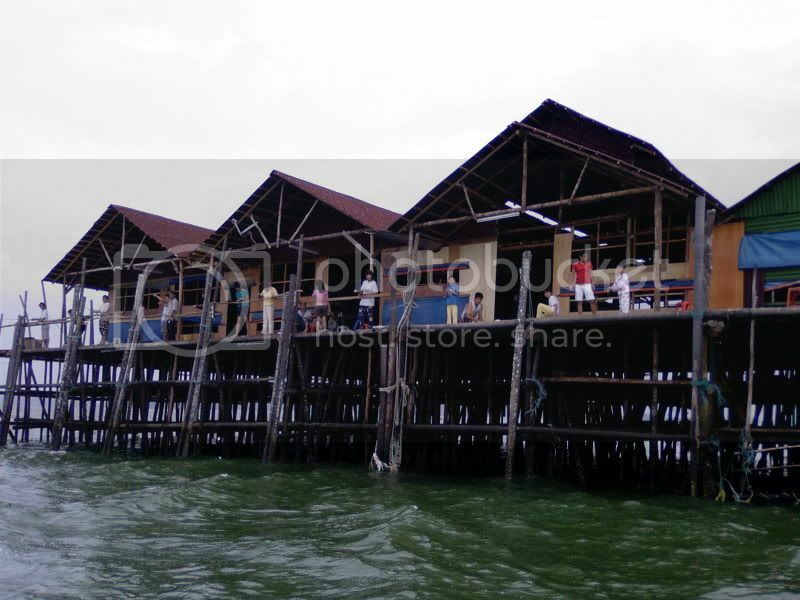 Kelongs are wooden structures build in the middle of the sea, like a fishing village. From what I have seen the Malaysian squid are not that big. I would try size 2! try the smallest avail jig. ive tested a bunch of tricks the thing they have trouble ignoring i found is a squid tentacle moving in front of them. i tried it because it looked like the little bait fish they chase at a glance. after the hiding I gave the squid yesterday morning they were a bit off the chew..so to speak..this morning so I stepped up a size to a 3.5 from a 3.0 and bagged a couple and changed jig colours 3 or 4 times too and made bugger all difference. hard to believe the difference in their agression to the jigs over the last 2 days but the water was a different colour today so I think that played a huge roll in their mood. Pink jigs size 3-3.5 work best for me. You should also try with a scoop net and put it in the water behind the squid and scare them into it cause they can't swim forward, I think it could work if the squid are close to the surface. I don't know about your squid but ours can swim forward at speed. Shy or low activity squid can be enticed by down sizing finding the correct colour for conditions and finding the correct action in your retrieve. If they are following the jig they can be caught. Tide/moon phase plays a part but you can do your best with presentation including leader length size and keeping your jig clean. As an advantage awabi sheet and or scent to get them over the line. Anyone tried using the egimax spray on fussy squid to see if that will tempt them into a bite? Boat, Shore, Pier EGI squid fishing in Thailand.